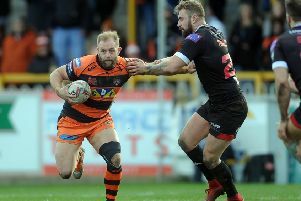 Castleford Tigers were not at their best, but their ability to find a way to get the two points against Wakefield Trinity shone through according to back rower-come centre Joe Wardle. After playing the whole 80 minutes at centre with the Tigers short of wingers and Michael Shenton moving out wide, Wardle accepted the best was still to come from Cas, but there were in a good place after their latest local derby win. “It’s just about knocking the points off and being consistent in what we’re doing,” he said. “We are still nowhere near playing the best rugby we can play. That’s obviously being dictated by the fields and stuff like that, but I think we are in a really good place at the minute. Wardle admitted it had been a tough game against Trinity. He commented: “I’ll be honest, I don’t think the ref helped at all, there were penalties left, right and centre so it was a really slow game, but the boys dug deep. We had a good defensive effort and it showed. “To be fair to Wakey, they came out at the beginning of that second half and really tested us. Wardle has played in four successive games after recovering from a hamstring injury and is pleased with the way things are going personally. He added: “It’s always nice to be playing. I don’t think (last Friday) was the best game, it wasn’t an outside-backs’ game, but it was nice to be out there with the boys and it’s another one ticked off for me coming back from injury.